The project, created and managed by Eco-Age, with support of the Commonwealth Fashion Council and the British Fashion Council, and in partnership with Swarovski, The Woolmark Company and Matchesfashion.com, builds on the premise of fashion as a common language. Brands from different countries, including Karen Walker representing New Zealand, Bibi Russell for Bangladesh and Burberry and Stella McCartney for the UK, will partner up to create exclusive, one-of-a-kind looks that will be showcased at a special reception at Buckingham Palace during London Fashion Week on February 19. Following the London Fashion Week showcase, which the Duchess of Cambridge and Countess of Wessex will attend, the exhibition will be made public at Australia House on February 21. 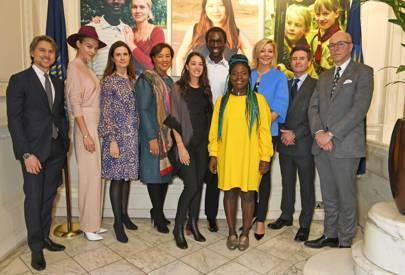 Digital partnerships with Matchesfashion.com and Google Arts and Culture will mean those who cannot make the London presentation will be able to engage with the Commonwealth Fashion Exchange via online platforms, and start conversations on how to take the initiative further.